Tess is not happy that her family has moved to Chicago from Florida. Not only is the weather very different from back home, but she misses her art teacher and her best friend. The house that her family moves into on Shady Street does not help matters either. An old house, built in the 1800's, it seems dark and uninviting. Tess and her family aren't living in the house long before Tess starts to get spooked. She finds a mark on her sketch pad that she didn't make, the lights flicker on and off, she has weird dreams, and her brother Jonah starts to talk about seeing ghosts. More and more strange occurrences take place and Tess comes to the conclusion that her house is haunted. When Tess is exploring her neighborhood she meets Andrew and, knowing she should make friends, introduces herself. Andrew has a friend, Nina, who knows a lot about graveyards. 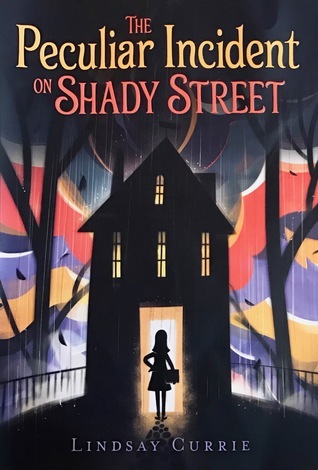 Together, the friends start investigating the mystery of what is happening on Shady Street. Their research takes them to a nearby cemetery where they begin to connect the haunted happenings in Tess's house to a six-year-old girl who died over a hundred years before. The friends' journey to figure out the mystery is filled with just enough spookiness to entertain middle grade readers without being too dark or scary. Middle grade readers who like spooky stories and mysteries will be intrigued by the plot of this book. But, this book is more than just a spooky story. Tess is a wonderful character navigating middle school life as she moves to a new place and has to make new friends. Tess shows that it's possible to make the best of a situation that is less than ideal. Middle grade readers will also be able to relate to the challenges of friendship and getting along with others that Tess works through in the book. An author of young adult and middle grade fiction, Lindsay is represented by Kathleen Rushall, of Andrea Brown Literary Agency. Her middle grade novels are published with Simon & Schuster/Aladdin. Her young adult novels are published with Flux/Llewellyn and Merit Press. The Peculiar Incident on Shady Street, published by Aladdin, is available today. Thanks to Lindsay Currie and the publisher for providing me with a digital advanced review copy of the book. This one looks like a great book to read this month!